Bonjour. I haven't had much experience in video production, nor am I French, so perhaps I'm not all that qualified to comment. I have, however, watched quite a few rugby matches on TV where the content was clearly controlled by French TV and since it is meant to be aimed at the viewer, I thought you might appreciate some input. See, the thing is...I don't have hard numbers to back me up but I'd guess at least 99% of people who watch a sporting contest actually want to see who wins as it happens. So while I appreciate that maybe you want to make your own direction stand out from the rest with abstract camera angles from around the pitch throughout the match, I thought on Saturday you might have missed the most important one of all. I assume that you got this gig partly because you've seen rugby before - if so, you'll know that if a team is just one point behind and marching up the pitch with the clock gone past the 80-minute mark, there very well could be a drop goal attempt coming. I would have thought the best angle for viewers [both on TV and in the stadium for those not in line with the kick] would be the one behind the goal. To be fair, this isn't just a French phenomenon. Most directors do stay with the traditional angle, but my point is that you and your predecessors have been, shall we say, the most 'experimental' when it comes to trying out different views over the years, so I'm suggesting perhaps you can be a pioneer once more and actually help the fans in the process? And not only had I no idea at the critical point that the ball had gone over the bar, the one sign I was looking for, namely referee Nigel Owens raising his hand to award the score, was also taken away from me as you cut away before he could...maybe you did go to a closeup of man-of-the match Johnny Sexton who seemed excited but even he wasn't altogether sure in the moment. My suggestion is not one that will make you nor your broadcaster a whole lot of money, but it will definitely settle the nerves of a whole host of your viewers, not just mine. Yours etc, JLP aka HarpinOnRugby. This could actually be the first ever HarpinOnRugby writeup to come with it's own soundtrack, or at least it's own song. Ever since I came up with the title it has been blaring in my head [even right now as I type], and I'm guessing now I have passed on the earworm to you; if so, welcome to the party. Yes, I went for it mostly because of the HIA controversy surrounding the match, but it also covers some other ground, because different thought processes need examining to fully understand what happened in Paris...those of the two teams, those of Sexton himself, those of the referee, and definitely those of the wider public who responded afterwards. So let's crack on, shall we. For me, this match was A Tale Of Five Kicks [my original title which got hijacked by Basement Jaxx] so let's list them and look at what led up to each one. I'm starting here because I firmly believe if that ball had gone over, the amount of nay-saying towards Ireland's performance would have been greatly reduced, as a two-score margin was probably good enough to bring home. Yet wide it went, so let's explore that negativity. Jeremy Guscott said on BBC we were 'too predictable' and he was countered by Phillipe Saint André who pointed out that our conservative approach was justified because, after all, we were playing at a ground where victories haven't come easily. This pretty much defines the extremes of the wide range of opinion I have seen online since the final whistle, and my own would tend to lean towards PSA. 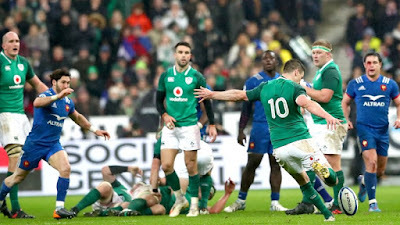 To say our failure to score a try was completely our own fault would be an insult to the French...they were set up for an 'irresistible force v immovable object' battle and they played their part brilliantly, led by their skipper Guirardo, who's 31 tackles wasn't far off the amount that earned Josh van der Flier much praise for Leinster against Connacht. We actually did try some different things, even right after the opening kickoff when Conor Murray punted out of his own 22 immediately; most would expect a Schmidt-coached side to run a few phases before exiting. But the risks were measured throughout, which is perfectly understandable in what was essentially a cup final for us, and up to the point of that Sexton miss, we were in complete control. And it wasn't as though we were getting absolutely nowhere with the ball...Joe had the team stacked with gainline-busting carriers [including Six Nations debutante James Ryan who was superb] and more often than not we were finding yards after the tackle but the closer we got to the tryline, the tougher the French resistance became. We definitely made a few technical errors like allowing the ball to be ripped free but I'd be more inclined to credit the home side than punish us. And let's not forget...our dominance was creating penalty chances of which Johnny nailed the first four. We mustn't forget our own defence...if you squint your eyes and ignore the try, we were perfect. All the French could do was try and ship it wide as quickly as possible but even when they did we were able to easily shut them down. Tack on the fact we only shipped six penalties in total and you have a decent day at the office for us without the ball - Ryan, Henshaw and our halfbacks were among the tackling leaders. However conservative our approach, we should have gone into the match expecting to win having conceded thirteen points. This is a good place to examine Nigel Owens' performance...I generally feel he's one of the best but let's just say he didn't do his reputation as a 'homer' any harm on Saturday...it took him a while to issue a warning for persistent French penalties and there was no card to be seen for the next one, the tackle on Murray before halftime was definitely worth a second look for 'no arms', and he failed to call a penalty on Rob Kearney's being caught in the air [eyes were on the ball but he made no attempt to jump or get out of the way]. Two factors to explore in the build up to this one...the Thomas try and of course the incident which, if history is anything to go by, will be known as #headgate. Despite the fact that we were so dominant in both territory and possession throughout, as long as the French were within a score I had a fictional try by them playing out in my head - Teddy Thomas brought it to life. For me, responsibility lies firmly at the feet of Rob Kearney - yes, I know he gets a lot of unjustified flack but look back on the site, it generally doesn't come from me. And to be fair, the first thing he did 'wrong' wasn't even wrong. It was an amazing clearance kick in terms of distance [especially given it was with his left peg on the left wing], but the ironic thing is, we'd have been better equipped to defend the French response if it had gone half as long yet also travelled far enough over the touchline so that they couldn't take a quick throw. But once he realised that they were going to come back at us, he rightly went to chase it down, yet when he got there he left acres of space between himself and the touchline and for me anyway, that is where Thomas was able to get the momentum to take him home. 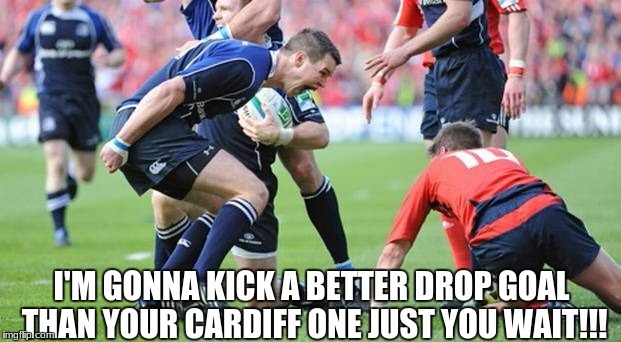 We can fault subsequent would-be Irish tacklers if we like but once someone like him gets going he's hard to stop. Much blame has been directed at Murray and Stockdale and it's true our overall defensive effort was poor for this play - but even if you argue that it was the actions of others that forced Rob to drift infield, every time I watch the try all I see is the massive gap along the touchline so this is where I have landed...it's certainly nothing personal against the man himself and overall he's having a fine season. So the nightmare scenario was realised and as we were recovering from that setback, Keith Earls knocked on outside his own 22 - that was the moment I was convinced we were done, and it was also around that time the #headgate sideshow began. Dupont's injury looked similar to that which befell van der Flier earlier in that he seemed to be wincing before any contact. However, if I were a medical doctor and only got to see one angle of the challenge on him made by Conor Murray, I could think that maybe there was a clash of heads and right now I could very well be defending our French hosts. But it was the earlier injury to Jalibert, also classified as HIA-worthy despite being far from his head, that raises the alarm bells here. Nigel Owens allowed the substitution based on the advice of the doctor, but was he acting on his own observation or the words of the French physio? I'll let the alickadoos do the i-dotting and t-crossing but from the evidence I can see [and having been burned before by something similar as a Leinster fan] it looks as though the French were keen on saving as many substitutions as they could and thus planned to cry 'HIA' for every conceivable injury. When you consider that their gameplan was to tackle us into oblivion, it only adds to the case against them. Thankfully, much like at the Stoop that day [when Nigel was also the ref by the way], the result didn't go against us, and for now all we can do is wait for the result of the inquest. But if found guilty, given the need to take the whole area of head injuries seriously, the punishment should be severe. So for Ireland it was a case of 'the good news is, we're still one point behind; the bad news, we've to get three quarters of the way down the pitch against a team we've been unable to break down'. What we needed was a series of plays executed with military precision, together with the right general on the field to call them. The Belleau kick passed the 'wrong' side of the upright with the clock at 77:18. As you can see from the pic, Sexton was already behind the posts ready to retrieve the ball and he was applying his boot to it at 77:27. These were clearly the actions of a man with a plan, and the first sign that his team-mates were with him appeared when Iain Henderson claimed the kick for Ireland. Everyone is talking about the 41 phases as a positive for Ireland but spare a thought for the French. Perhaps they could have driven a Sherman tank onto the field and Nigel wouldn't have called a penalty but overall our discipline in retaining possession was matched by their not risking getting pinged in a quest for a match-clinching turnover. And shortly after Henderson got us the ball we were essentially getting nowhere. Phase after phase after phase might make five or so yards but then a strong tackle would send us back. We were the ones behind on the scoreboard and it was up to us to take the risks. Finally, on phase #24 amid gasps of 'What the hell is he doing?' from all Irish fans [oh alright it was me but I doubt I was alone], Sexton places a perfect kick pass which Keith Earls hauls down out of sheer determination, although his opposite number Vakatawa didn't seem to want anything to do with it. Now in the French half, it was time to regroup and my assumption was that we'd be setting up for a penalty. Forget the kick itself for the moment if you can. Just think of where Johnny's head was at when he decided to retreat into the pocket and give the call to his scrum half. The match had been going mostly to plan before he misses an easy penalty to virtually secure a win. Then came the try and the farce of the Belleau substitution. All of that would make mush of my decision-making, that's for sure - I'd be running on fumes. 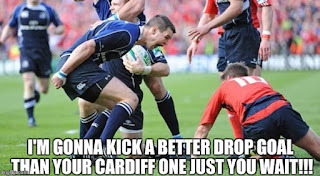 Yet he was able to somehow recall a similar situation against Treviso for Leinster and based on this, plus the fact that he knew his forwards were probably shattered, PLUS the fact that he seemed to be suffeing from cramp moments before, he backed himself to nail it, which he did despite the improbable distance. Extremely honourable mention must go to Conor Murray for providing the pass, as well as the rest of the team [Henderson and Stander had key carries towards the end but it was a team effort] of course for setting up the situation. It was an incredible match - in many ways the best kind, though we certainly wouldn't want to be going through that every week!!!! But you'd have a hard time convincing me we didn't deserve it. Right....now, where are our heads at as Irish fans??? Well, for me, even if that fifth penalty had gone over and we were spared all the drama yet still won without crossing their line, I wouldn't be too concerned for the immediate future. I honestly can't understand how anyone can imagine the way we set up in Paris is going to resemble that for any of our remaining matches. As for the other action this weekend, England looked ok in places, Scotland disappointed, and Wales impressed. But we've been down this Six Nations road enough times to know that they will all pose different challenges when they cross our path, so the only thing that matters right now is Conor O'Shea's Italian squad next weekend.